Itemis-jhse-600 - Wedding of Mackie and Gladys Shuler. Itemis-jhse-620 - Abraham Estrin and Rebecca Gofsky Wedding. Itemis-jhse-261 - B'nai Brith Girls 1958. Itemis-jhse-601 - Wedding of Samuel Lieberman and Nancy Berman. Itemis-jhse-621 - Members of Jewish Family Services, Edmonton, Alberta. Itemis-jhse-262 - Dan Kauffman delivers greetings at Herb Leon Dinner. Itemis-jhse-291 - Norbert Berkowitz, wife Sheila and her mother, Vera Lipsett. Itemis-jhse-602 - Wedding of Mozanne Baltzan and Marvin Dower. 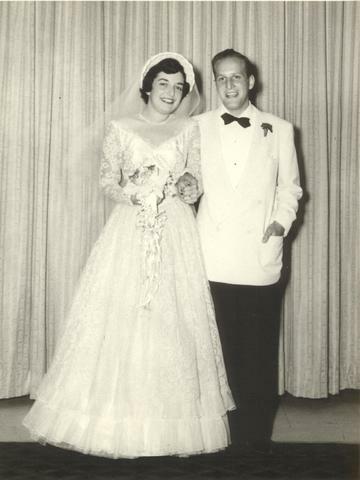 Item is-jhse-601 - Wedding of Samuel Lieberman and Nancy Berman. Wedding of Samuel Lieberman and Nancy Berman.